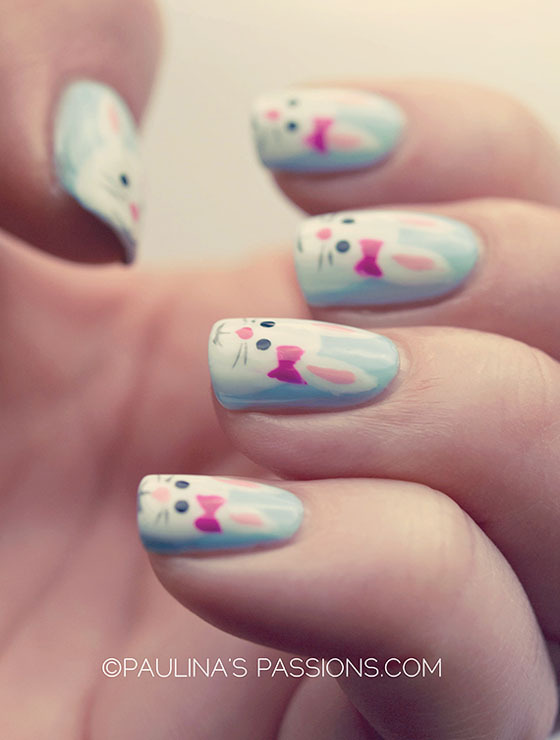 Add a fun and fanciful flair to your spring wardrobe with an Easter themed nail design. 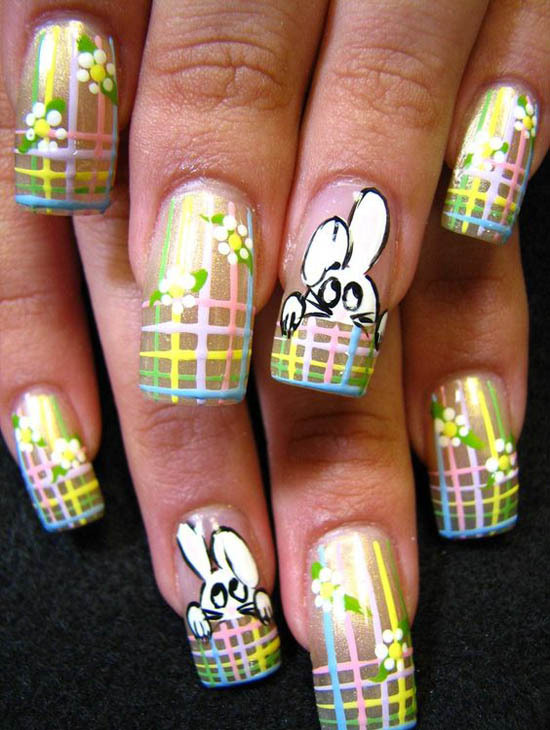 Let Peter Cottontail hop off the bunny trail and right onto your fingertips or maybe a springtime nest of baby chicks takes their place cheerfully on your nails. The soft pastel hues of spring provide a peaceful backdrop for the change of seasons and the warmth of brighter days. 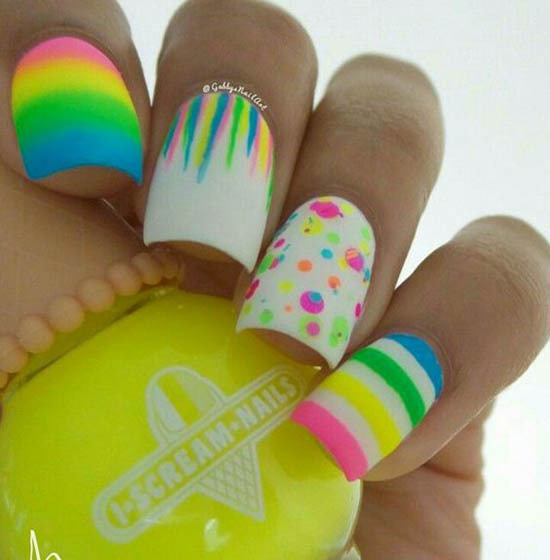 Let your nails be an expression of the joy you feel as you peel off the cold darkness of winter and replace it with the warm sunny glow of a cheerful nail design. 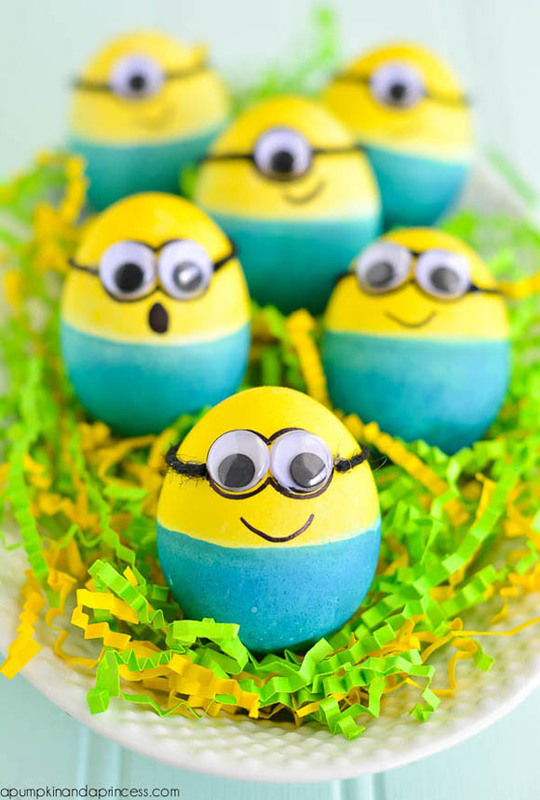 Check More Fun Easter Ideas! This little chickadee is breaking out to let everyone know that spring is here. Contrasting maize and black are beautifully accented with just a touch of glitter. Throw in a 3-D bow and this little girl will create a spring spectacle. Soft pastels create a palette of springtime beauty for this happy little bunny. Draw smiles as your nail design celebrates the season of warmth and renewal. A touch of sparkle rounds out a seasonal Easter motif. What’s more fun than a hatching chick in springtime? A whole bunch of hatching chicks in springtime! 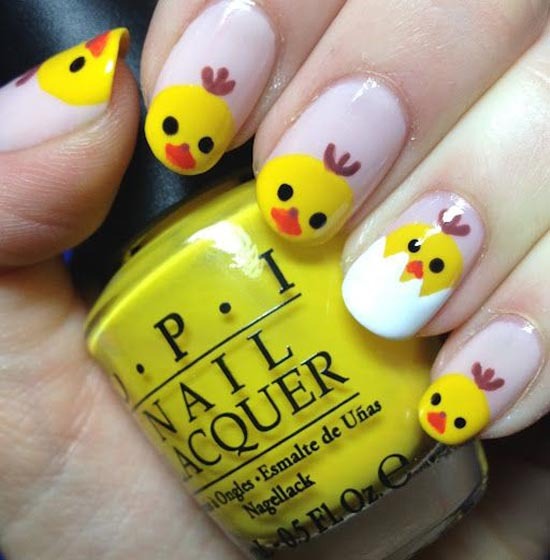 Let these little cuties share your joy that spring has finally arrived. 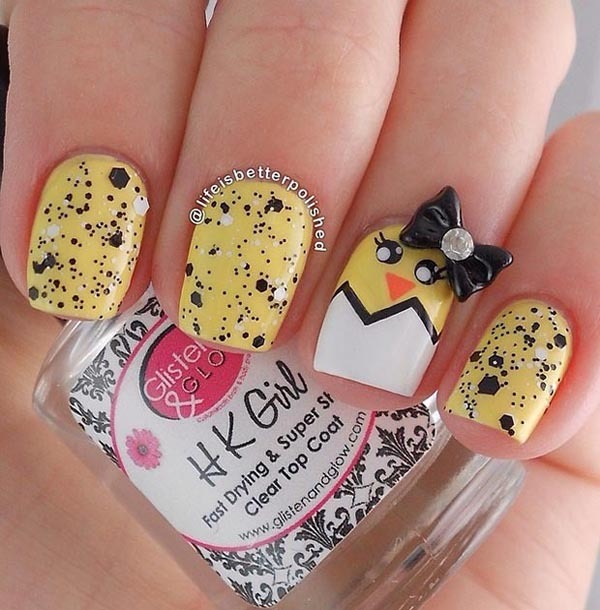 The soft yellow background coupled with the speckled white eggshell creates a clean, innocence to this nail design. 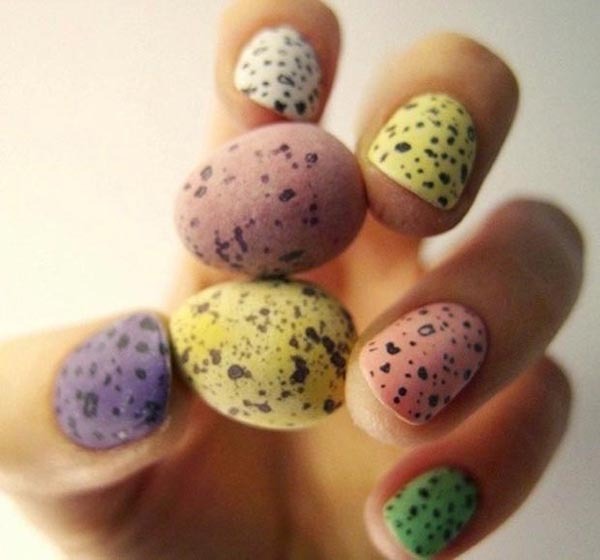 Speckled eggs have become a favorite in many Easter baskets and this nail creation has taken notice. 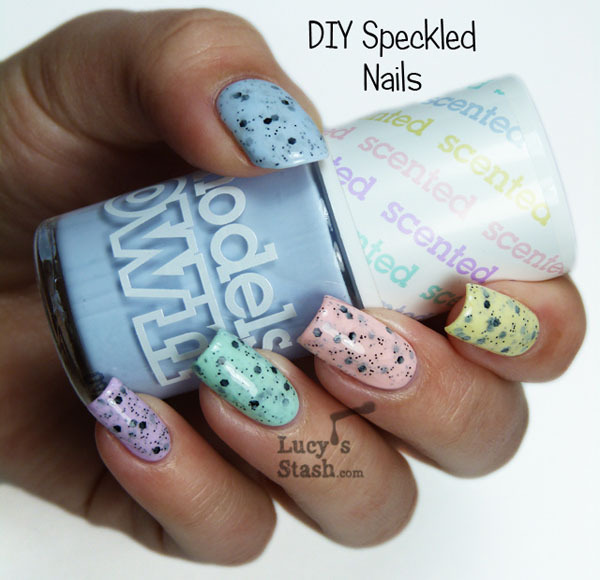 The soft, matte hues topped with the black speckling is reminiscent of a tasty candy treat. Chirp, chirp, chirp…..the hatchlings have arrived! So sweet as they peek their little faces off the edge of your nails. These little feathered friends will accompany you with lighthearted whimsy. Bring some feathered friends on your springtime adventures. Back in the day, Easter dresses were adorned with ric-rac ribbon in soft pastels. 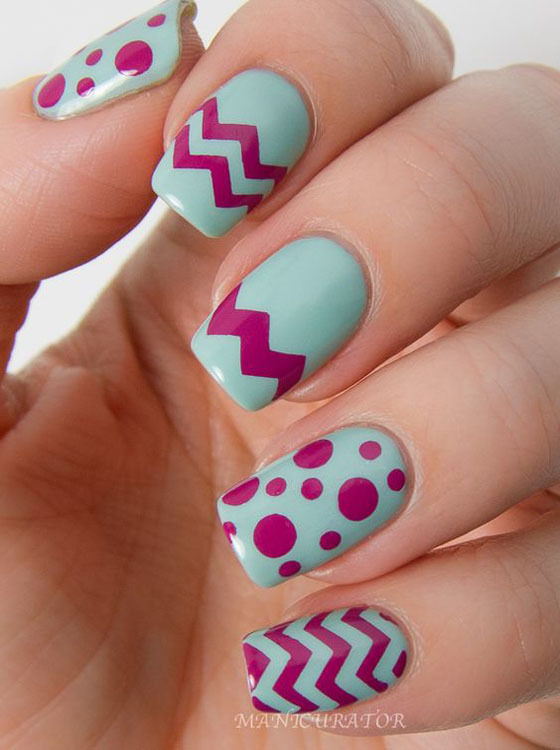 From that era springs forth this nail pattern using the tried and true zig zag pattern. 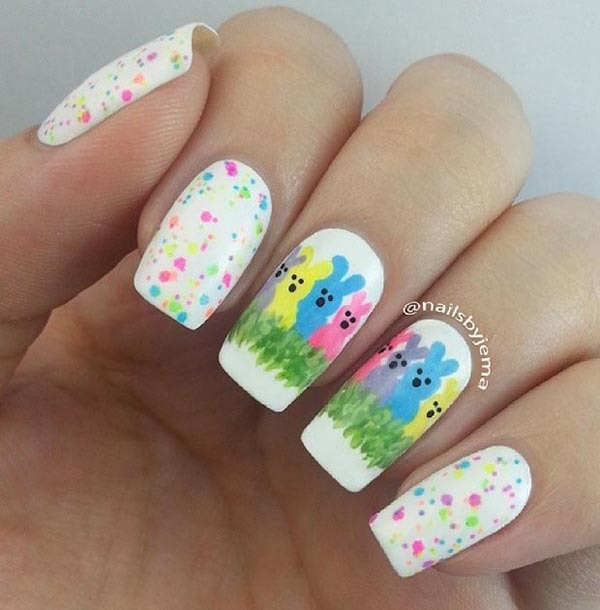 Throw in some petite little florals and some polka dot accents and you have a recipe for a fashionable Easter nail design. 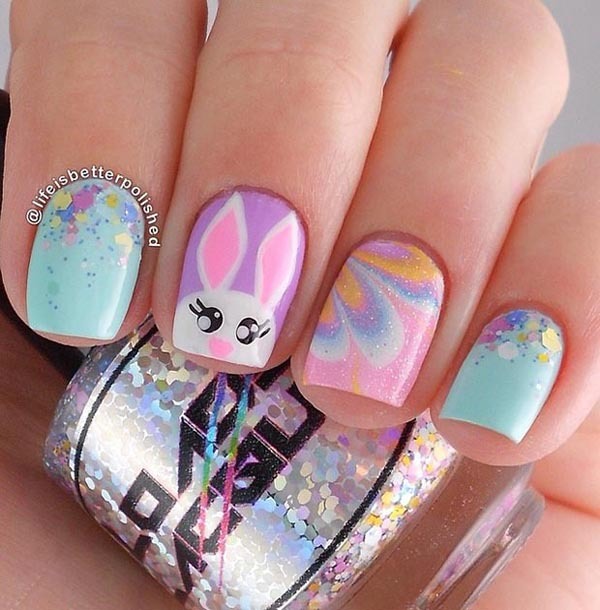 Pastel bunnies take center stage on a gleaming white background accented with a fresh speckled look. These little spring visitors are nestled in the sweet green grass and ready for some frolicking in the warm sun. Share your Easter joy with this classic symbol of spring. 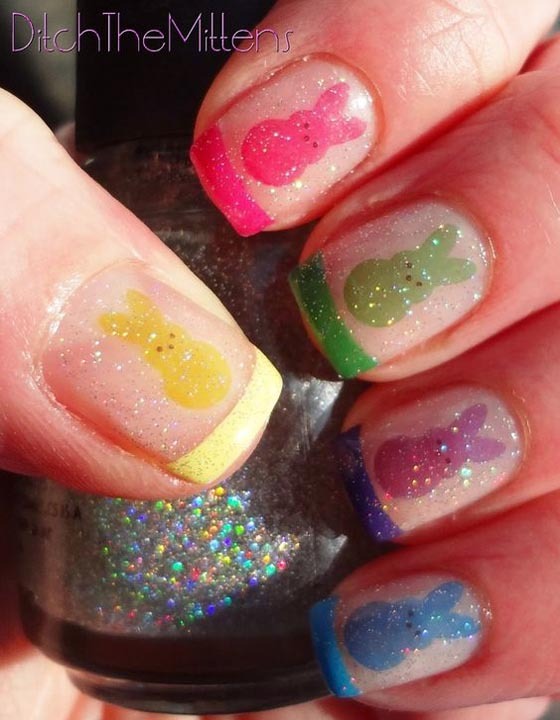 Tucked safely under a showy layer of sparling glitter are colorful bunnies sharing their message of Easter joy. 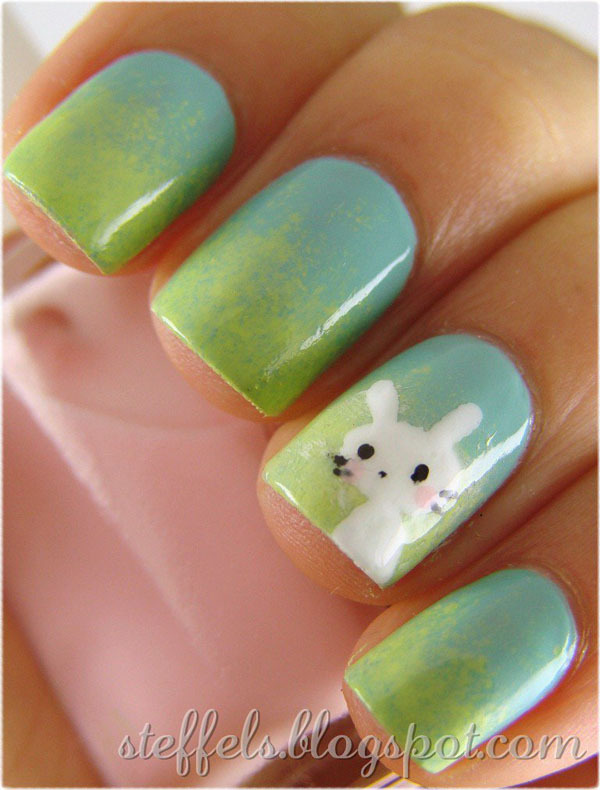 Each pastel bunny has matching nail tip accent to pull the concept together. This subtle yet simmering design wears well for any occasion. 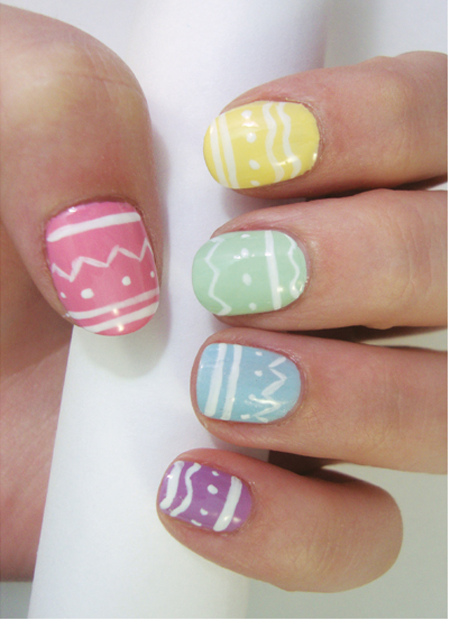 Springtime pops with thisfresh design in classic Easter hues. 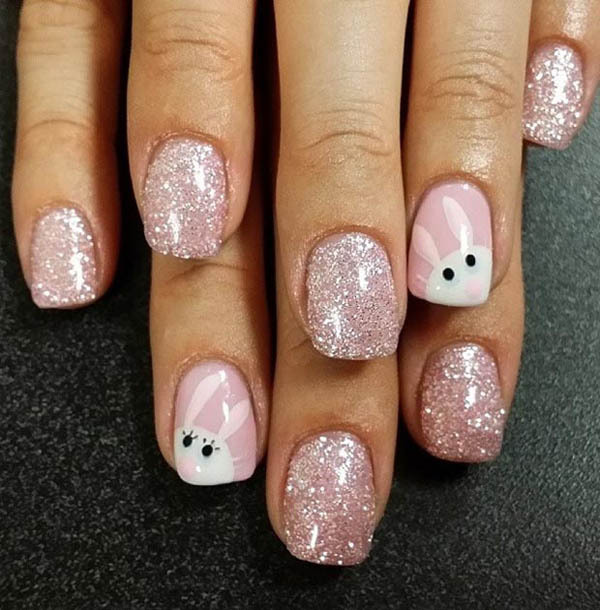 The softness of the nail tips accented with just the right amount of glitter is the perfectly adorned with aposey or two. Awaken your playful side with a collection of delightful Easter peeps. 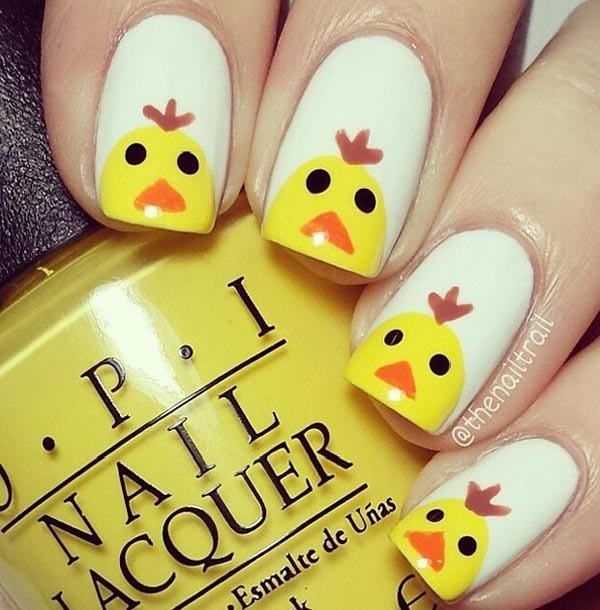 Bright yellow spring chicks perched on a white background give a chipper look to your spring fashion. 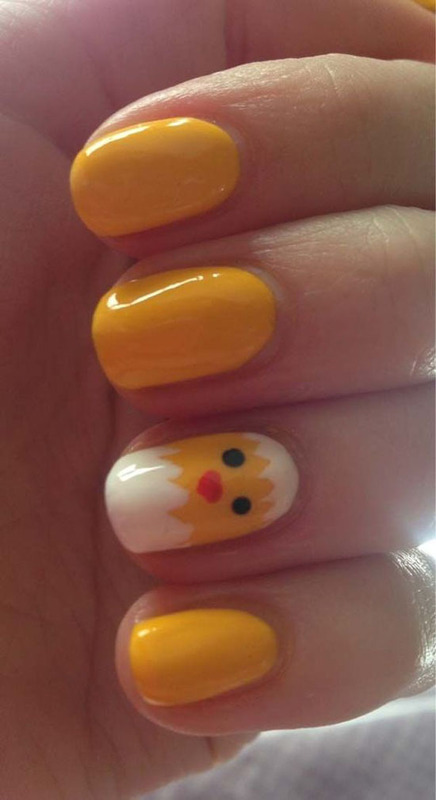 This magical and feminine nail concept has it all. The shimmering pale blue backdrop creates the perfect canvas for some artfully designed Easter eggs. Topped with a flirtatious pink bow for the extra bit of WOW. 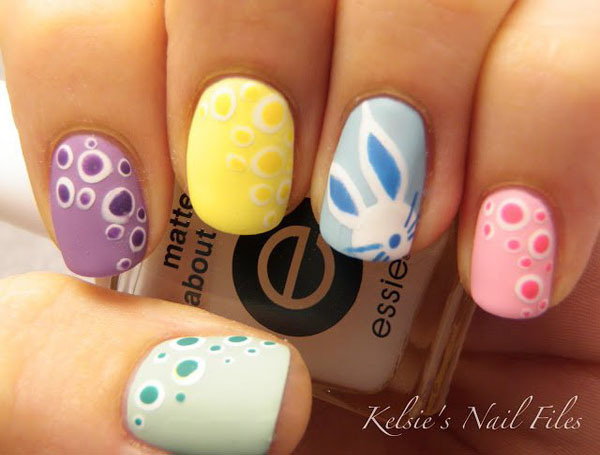 Easter is the right time to make a statement that you’re ready for the change to more lighthearted and playful days. 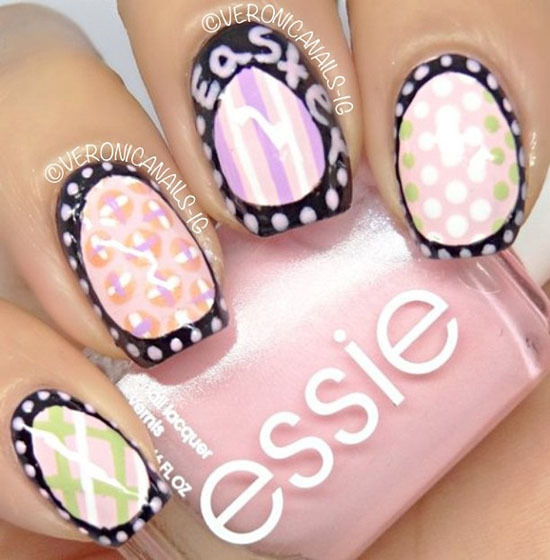 Put those winter sweaters away and break out the spring wardrobe with this delightful nail design. Fruity colors pop on a canvas of white. 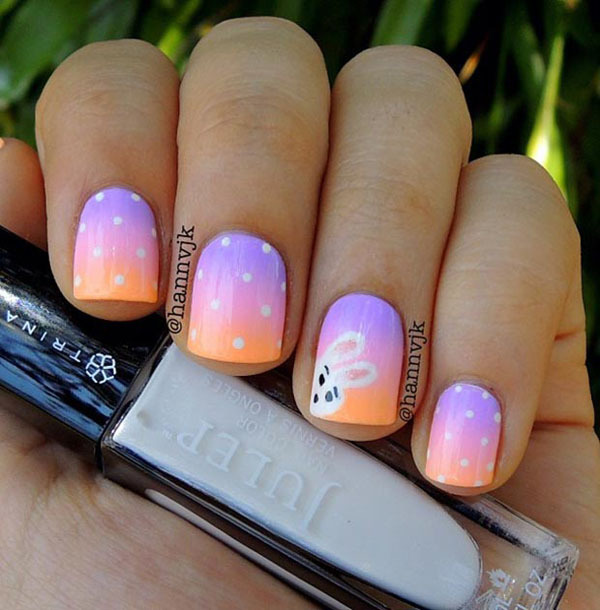 Who’s that peeking out from behind that exquisite nail design? Could it be the Easter Bunny? All the colors of spring come to life in shimmering detail with this attention grabbing display. 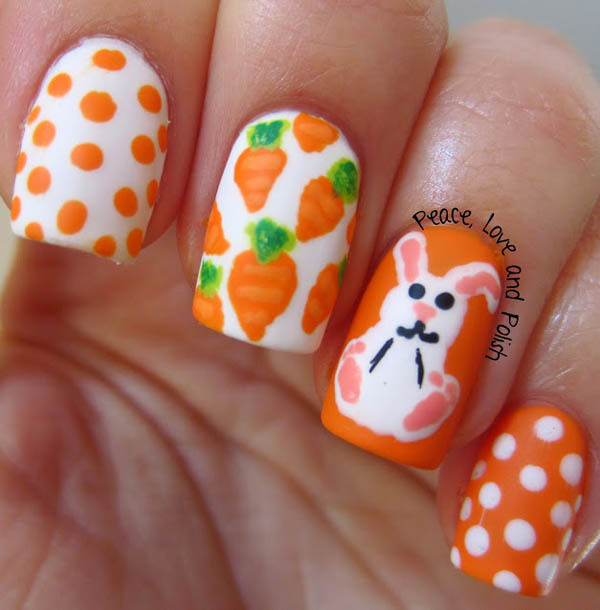 A winning combination of all things Easter! If the sparkle doesn’t catch your eye, the fuzzy creature peeking out certainly will. This shy little bunny isn’t sure if it’s time to come out for Easter yet so he’s barely making his presence known. 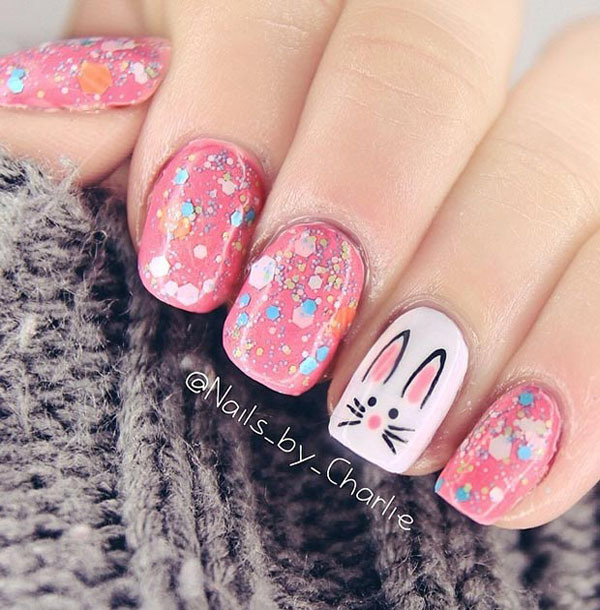 The delicate pink sparkle with just a glimpse of the Easter Bunny is a winner. 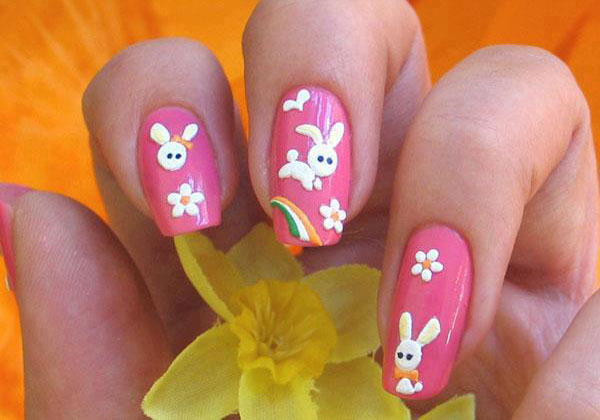 These delightful bunnies will awaken you to springtime fun as they hop across your fingertips. Subtle colors blend together in awesome detail. The repeating design gives continuity to this playful design. The occasion has arrived for a famous springtime visitor. 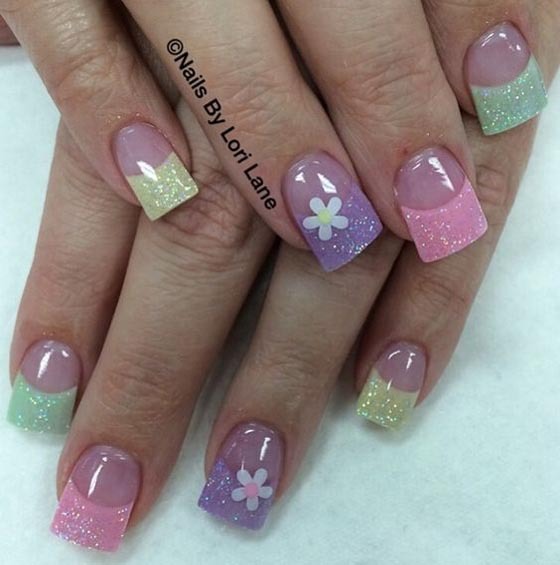 The Easter Bunny has hopped into town in glorious fashion with this protrusion of glitz and glam. The bubblegum backdrop sets the stage for a visit from some lively little bunnies. Accented with delicate flowers and a rainbow trail…this hoppy design will give a youthful flair to your spring fashion. It’s hard to round this guy up? He’s here and there and just about everywhere! 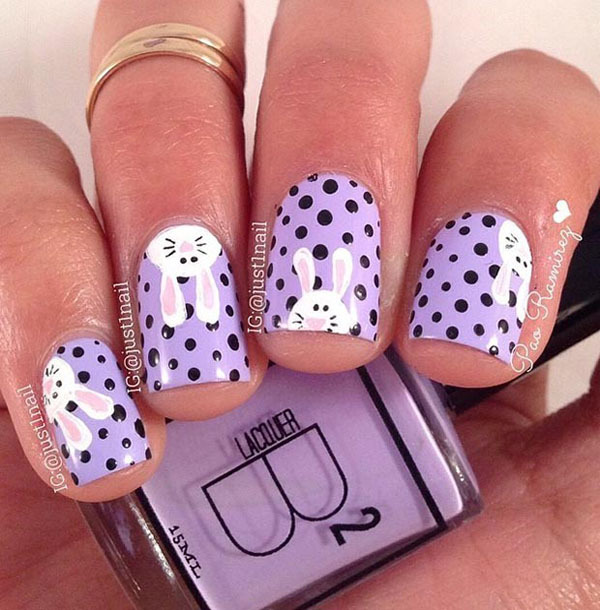 The spirit of the Easter season is captured on a soft lilac backdrop with the skillful placement of a lively bunny. 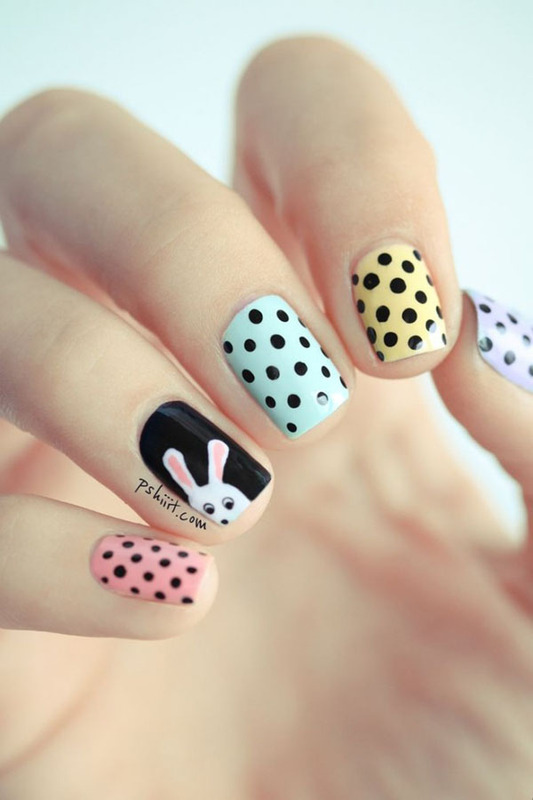 Accented with black dots to create a flirty feel. This little guy looks so sweet and innocent he must be a baby. Gently poised on a frosty aqua lime background, this spring friend is hopping by to say hello. 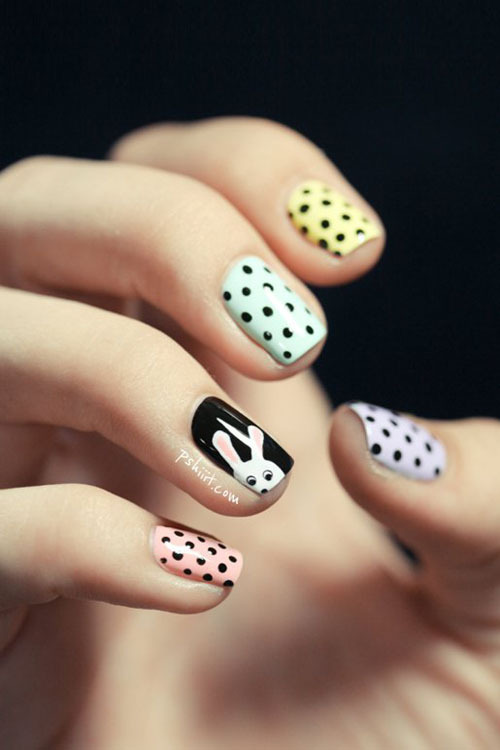 Show off your edgy side with an Easter nail design that’s both comical and spirited. The bunny image pops forward against the coral base. 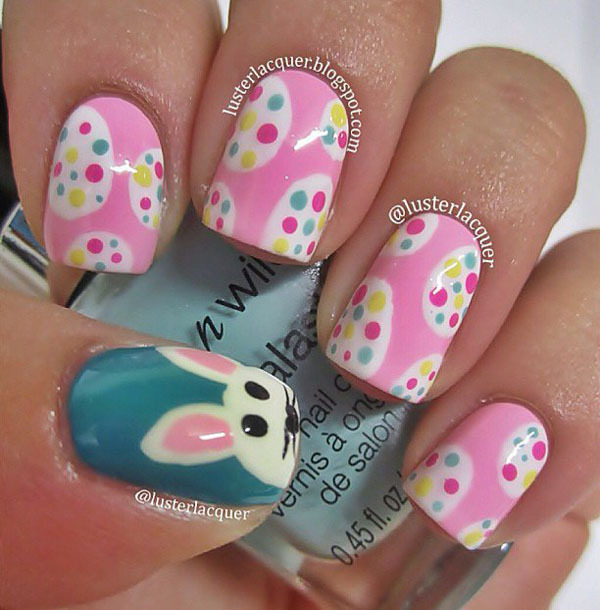 Put on your Easter bunny ears for some spring fun! 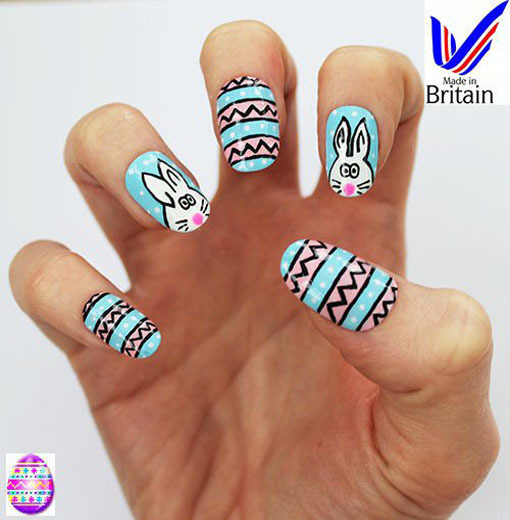 Your passion for the Easter season will be front and center when you sport this lighthearted nail motif. 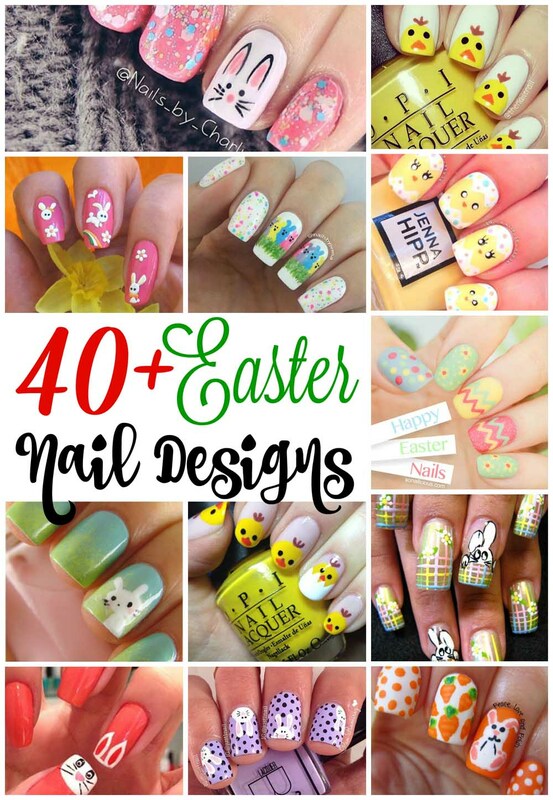 From the seasonal color palette to the bunny images, everything Easter is captured on your fingertips. The intricate dark patterns really pop against the pastel base. This fuzzy bunny made a visit and dropped off a special delivery of some magical Easter eggs. The softness of the hues and the detail of the eggs work well together to create a delightful holiday design. The pink and gray combination give birth to a warm and cozy feel. The signs of spring come to life with the chipper images of hatching peeps. 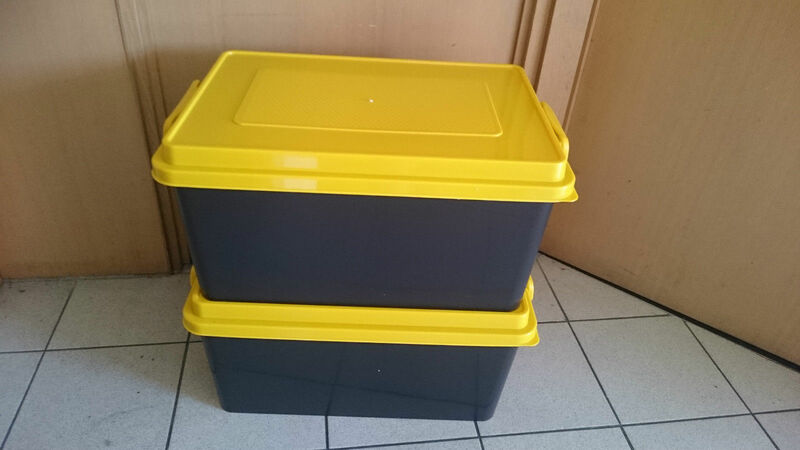 Cheerful colors awaken feelings of warmth and sunny days. 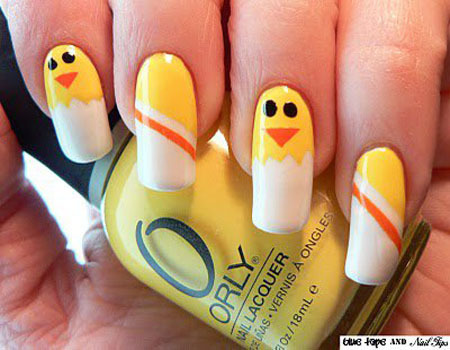 Enjoy this “tweet” nail creation! Like the view through a telescope on a star-filled evening, this nail design evokes a frosty cosmic feel. 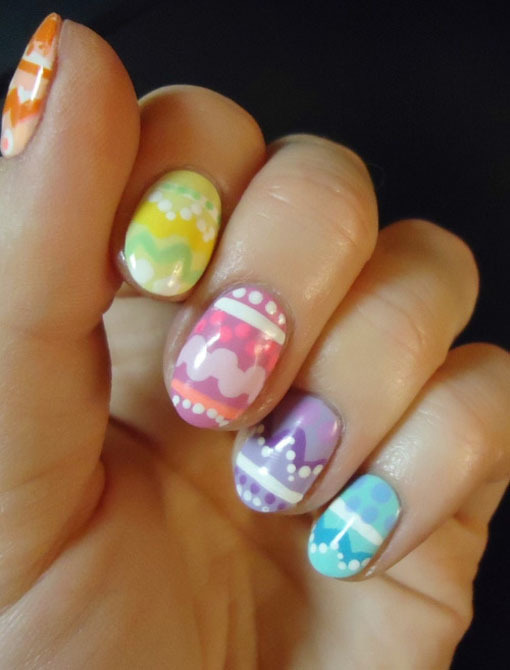 Add in one little peeking bunny, and you have a charming Easter time nail display. 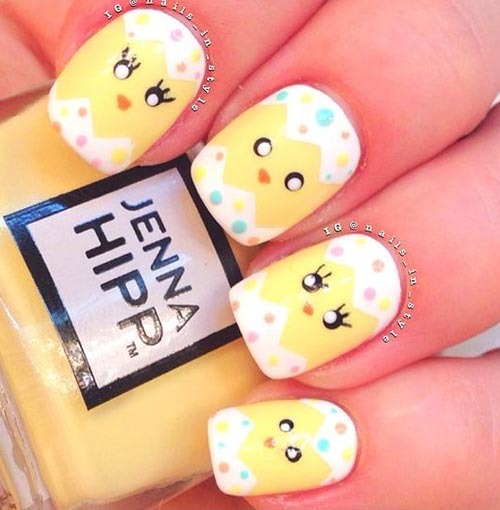 Bold golden base accented with the sweet image of a hatchling says spring has arrived. Simple and uncomplicated, this straightforward design makes a playful statement. The spring palette of colors all take a turn showing their beauty. 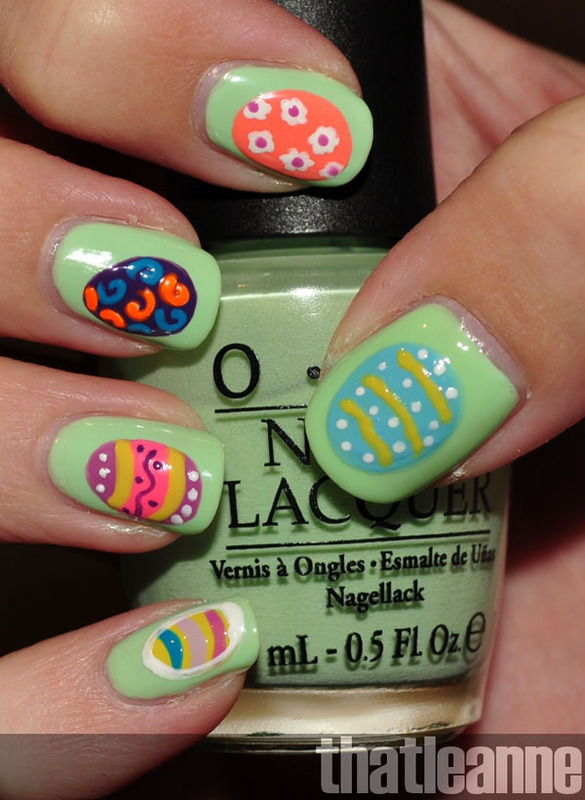 Accented in a youthful way, this bubbly Easter design captivates the essence of happy holiday fun. This naughty little bunny only comes out at night. Peeking out on a backdrop of midnight black, a clever little bunny has plans for some Easter fun. The subtle spring palette of colors and polka dotted accents make a playful statement. It only takes one bunny to make Easter leap into your heart. 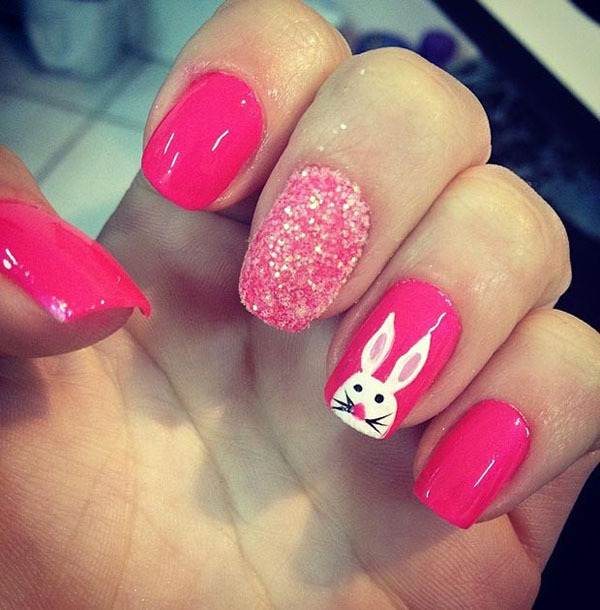 Show off your flair for Easter fun with an eye-catching hot pink and sparkle design accented with a smile evoking springtime character. Tell the world that He is Risen. Beautifully simple, the symbol of the Easter message is brought to life on a delicate blue backdrop. Accented with a glorious bit of sparkle to serve as a reminder of the light that shines this Easter season. 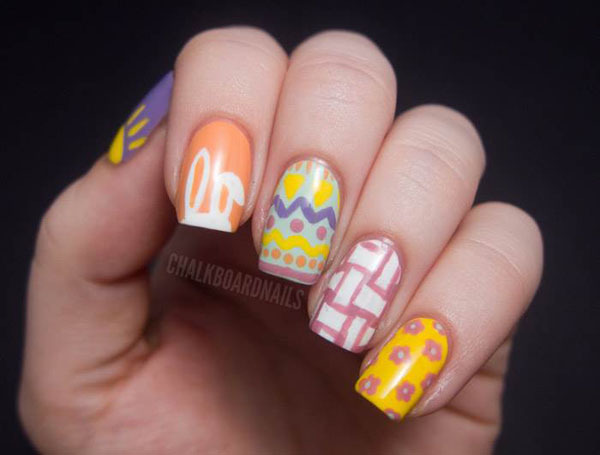 Wake up your fingertips after a long winter with a playful, colorful nail design. Patterns and colors work well to create a dazzling display of springtime fancy. 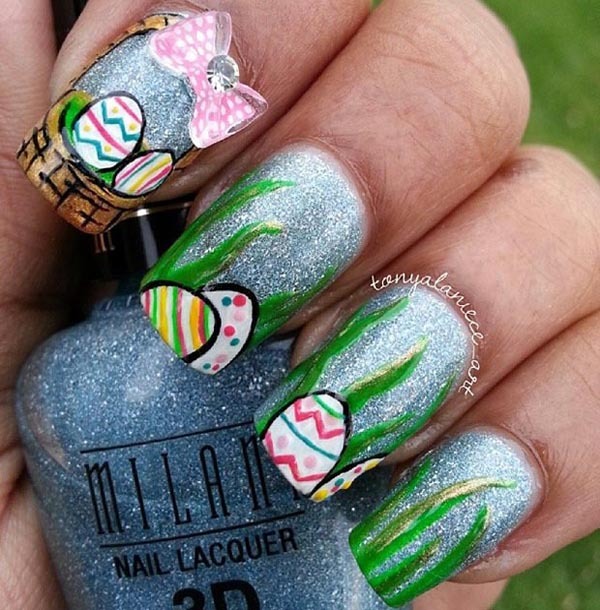 You won’t be able to take your eyes off the amazing detail of this Easter nail design. The white base provides the perfect canvas to showcase incredible intricate patterns. Add a special touch to your spring outfit with this impressive design. Soft spring hues band together to create a canvas for the detailed white patterns on this delicate design. 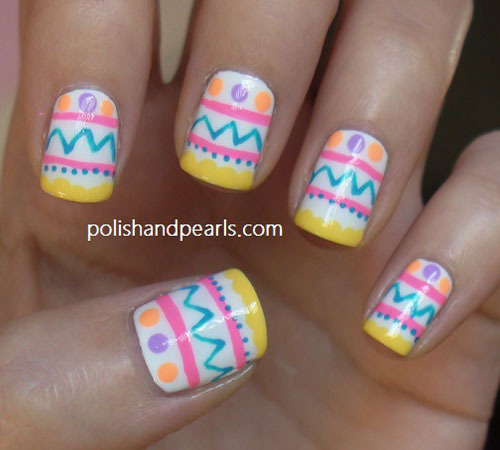 Lots of subtle color and pleasant accents to add charm to your Easter outfit. Looks like this bunny will have plenty to snack on this spring. The vibrant tangerine and clean white color combo create a lively and lighthearted design. 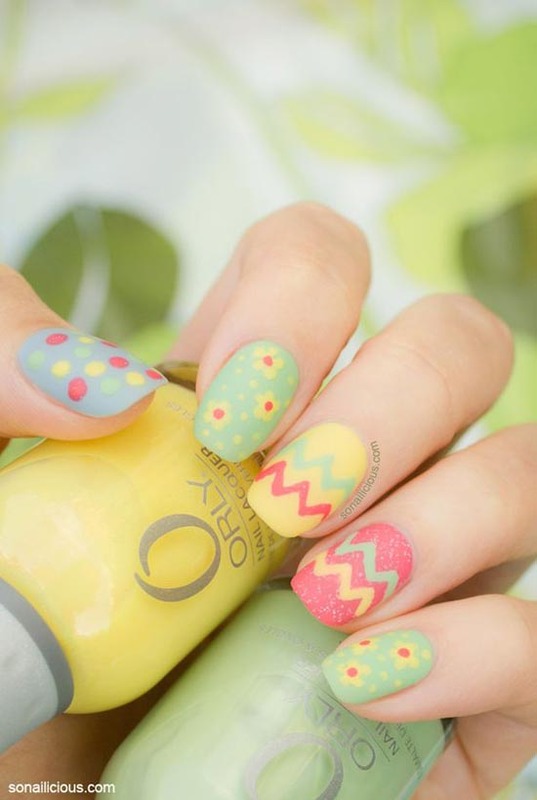 Filled with intricate detail, this cheerful Easter time design will bunny hop right into your heart.